The fabric raises questions about the slipperiness of authenticity and the complexity of modern African identity that for Shonibare—born in London, raised in Lagos, living in London—are personal (he calls himself a “postcolonial hybrid”). In his work, he has used Dutch Wax to make frilly period garb for the headless mannequins that figure in his outlandishly theatrical tableaux, book jackets for his British Library project (comprised of titles by non-British authors vital to the English canon), and sailcloth for his ship-in-a-bottle replica of Lord Nelson’s HMS Victory, which for a time he displayed on a plinth near Nelson’s Column in London’s Trafalgar Square. Recently, Shonibare has abstracted the material into his Wind Sculptures, towering, static fiberglass constructions, painted with Dutch Wax motifs and made to look like massive diamonds of fabric flapping in the wind (the design process involves hair dryers). Connected to the ground by a single point, they are exuberantly anthropomorphic, a little bit ballerina, a little bit Dr. Seuss. 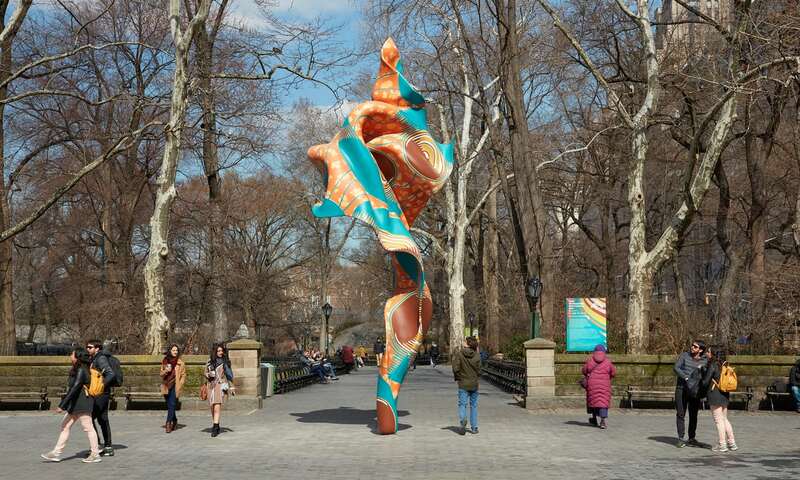 His latest in the series, the first made with a new 3-D modeling technique that allows for more flamboyant undulations, goes up on March 7 in Manhattan courtesy of the Public Art Fund. It will grace the southeast entrance to Central Park at Fifth Avenue and 60th Street through the summer.